I recently heard one of her songs and was hooked on her smooth voice. I knew the song had come from the "Feels like home" CD, so I purchased it. Now I'm thrilled that I did. I love her voice and I wish she'd produce a Christmas CD. I think it'd be well recieved by her fans! I'm not a huge fan of country music and she certainly has a country feel, but it's a much more complex sound. I highly recommend this CD. I've adopted it as my new "night driving" music of choice. I purchased this same cd in 2005 when I was pregnant. I listened to it over and over because it was so relaxing to me. After my son was born, I found that whenever he cried, all I had to do was put on Sunrise, and he would stop crying IMMEDIATELY! I wore that one out, so I needed to purchase another. He's six now, and LOVES listening to the cd with me. 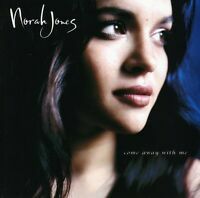 Proof that Norah Jones has the voice of an angel. Kids don't know how to fake love. Jones shoots and scores with her second major release, which includes a track featuring the vocals of Miss Dolly Parton. Although not as striking as Come Away With Me, this album is quite the relaxing device. Jones' voice is something else, and the smooth jazz arrangements mixed with pop personell and a killer backing band form a disc of sophisticated pazz & jop. Her first album. Loved by many people. I've learned to like all of the songs. I can't say the same about all her albums.